Hope the first post of this blog series gave you some ideas on how to start modeling with AAC and Avaz. With this series, we are attempting to provide some reference points for you to run with, and make it your own. Or perhaps, some of the points discussed would spark an entirely new idea – which we would love to hear about! In the present blog post, we will be discussing some tried and tested communication tips sourced from parents and therapists. As with the last post, these are in response to questions asked by first-time users of AAC apps. Please note, for this post, we have clubbed together two questions addressing similar themes. Q2: How to encourage communication? To encourage communication – I have put together the whole sentence – “I want to blow candles” under the single picture of candle. Likewise “I want chips” under the picture of chips. I did this so that the complete sentence is spoken out by one touch. Is this OK? Q3: I have started using Avaz only recently. I created a home screen for my child with his picture with the caption “I want” and then added toilet, water, food and some of his reinforcers like mobile, TV etc. I guided him to use Avaz. When I served him spicy food, he immediately came and touched the water picture. Now, should I insist on touching the “I want” picture or just add “I want water” to make him hear the complete sentence. Adding the entire sentence under a single picture could restrict communication to only the pre-programmed sentences, thus inhibiting spontaneous communication. What if the child wanted to say something else about the chips or the candles, and not actually want them? For example, what if you or the child wanted to talk about how yummy the chips were? We will not be able to do that if the whole sentence/request was embedded in one icon that says “I want chips”. So, it would be best to separate the words and model different ways to use those words. Furthermore, the child taps an icon and it pops up, the child sees the icon of a candle but hears the sentence “I want to blow the candle”. This could lead to confusion about what they hear and what they see. Instead, if the words candle or chips are learned and used independently, this problem may not arise. 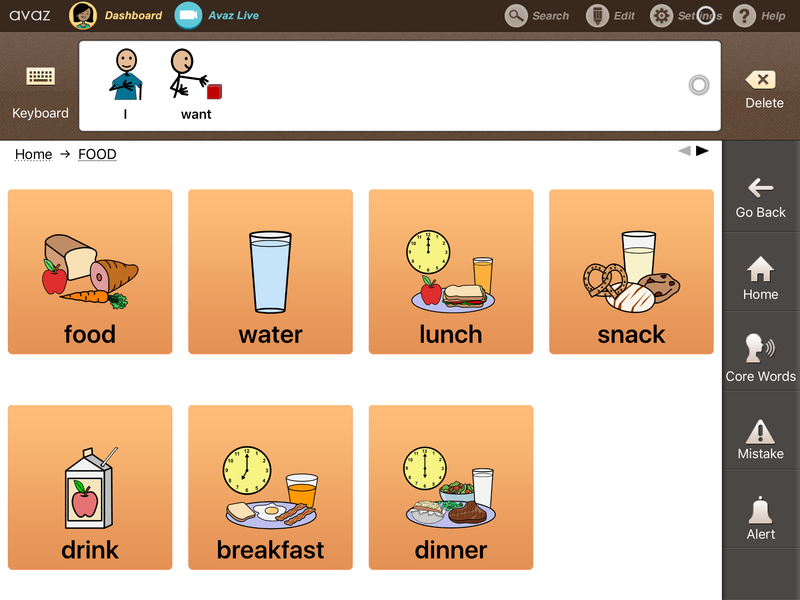 As the child starts using Avaz or any AAC tool, they will eventually attempt to say the words they hear. When that happens, it will be difficult for them to say an entire sentence to start with and might discourage them from trying. Instead, making a start with different individual words would motivate them to try speaking out loud. Hope these ideas are helpful! Do you know of any other simple and effective methods to encourage communication? Please do share your thoughts on all of this and more, in the comments section! We sincerely thank each parent, teacher and SLP who contributed with their valuable suggestions. Our special gratitude to Simona Korkmaz, Gita Arvind, Gemma White, and Priya!